The location and size of this cabin was perfect. We enjoyed staying here.. besides the big bees that make homes in the wood which limited when we could enjoy hot tub, swing and just sitting on porch.On the picture it doesn’t show all the bushes that are actually all around which make it easy for bees and wasp. We fought to get in and out even after we called.The bed needs replaced you can see dent in mattress soon as you walk in the room. l always rent through Cabin USA l would do a different one next time! Awesome location, and cute little cabin! It was perfect for a few day getaway! Would definitely recommend! We had an amazing time and the cabin is in the perfect location if you want to be close to Tanger Outlets, The Alcatraz Museum, Titanic Museum, and tons of family amusement facilities. We will definitely be visiting again with the children as we were taking a couple retreat this time. It needs to be cleaned better & there was no bottom sheet on the bed down stairs,couldn't find one to go on it either. We love the cabin it was clean and it had everything you could need . The only downfall is the king size mattress upstairs level really needs to be replaced it felt like you were sleeping on a box spring . We enjoyed our stay. We did have hot tub issues that we reported and was fixed. The beds could have been more comfortable. Other than that we had a wonderful stay. Already have a place reserved for March through cabins usa. The place was very nice. The stove had 2 burners that didn’t work. I called to get extra toilet paper, I was informed they did 1 roll per bathroom, and I need to go to the store and buy more if I needed it. We had 5 people staying for 8 days. Slightly frustrating! Most hotels will give more toilet paper when you run out. Nice cabin, great location. Check in was done on-line; very easy and straight-forward. Location was perfect for all of our activities. Cabin was comfortable and met or exceeded our needs. We will likely stay with Cabins USA again in the future. WiFi was spotty and had to be reset numerous times. Carpet and decks were stained in may places, fridge had a broken drawer, foot stool downstairs was broken, downstairs tub floor was very soiled and the pool table is very worn. Parking for two vehicles was tight. Beautiful cabin we enjoyed our stay! We had a wonderful stay. The pool table was pretty worn out, but we used it everday. Also, the upstairs was always hot while the down stairs was always cold, really cold. The master bed was uncomfortable, but I learned about the beds at cabins years ago, and I travel with a pad to apply to bed if needed, and I did need it. But over all, we had a wonderful time. Thanks for a great stay. We noted, like others before us, the need for blinds on particular windows. The rest are just personal, like -because I am asthmatic- I am super sensitive to things that can harbor dist mites such as the sleeper sofas and cabinets. It did not hinder me much, but if/when replacing sofas, they should consider the leather sofas similar to other cabins. Our stay in 2017 was HORRIBLE, Cabins USA gave us a deal on a "second chance" in 2018. We stayed at "Autumn Ridge". IT WAS PERFECT! All items/amenities listed on website were present! Just 2 minutes from the POOL. All equipment worked as advertised. RESULT: We would like to say 10 days in 2020, at Autumn Ridge for our next family reunion. My 5 year old grand daughter LOVED it and asked for Autumn Ridge specifically when we come back---SHE IS THE BOSS! Again, a great stay, but too short! I thank all at CABINS USA for this trip. Perhaps we can "make a deal" since that is what my president does to SUCCEED!. I hope CUSA was pleased with the way we left the cabin, as well. The only drawback was the parking. We had no room for two large vehicles, for a 2-FAMILY cabin. I went into the ditch once, but not a problem. Perhaps enlarge the mult-family drives. Beautiful cabin. Well maintained and very up-to-date. Conveniently located to everything. Staff was very friendly during check-in & check-out process. We had an issue with a leak down stairs and maintenance was there within an hour—he was not as friendly nor did he return as stated to correct issue. Only other complaint, website mentions pool available however it’s seasonal. Overall everything was great! Would definitely consider staying at Autumn Ridge when I return to the Smokies! We loved the cabin! Both families agreed to rent the cabin again. When assistance was required the technician was very professional and knowledgeable in repairs. We even encountered a bear crawling around the cabin. what a beautiful site. We loved our cabin! It was clean, comfortable, and close to everything. The only complaint I have is that our power went out for about an hour. I called the office and no one ever called me back. Eventually our power came back so I didn't pursue further communication. However, it would have been nice for cabins Usa to make sure everything was okay. Other than that, we had a great experience. Great cabin for the money, also the cheapest cabin I found. Our family had our first multi family vacay in Autumn Ridge and we loved it. The beds are uncomfortable and the decor was kinda strange but overall it was great. We hope to make this a tradition and plan to stay with Cabins USA again next year. This was the first time staying in a cabin and we enjoyed it very much. It felt like home and it was much better than staying in a hotel/motel. The location was perfect. There were 5 of us (myself, my wife, our son and daughter and our future son-in-law) , we had plenty of room and we were able to spend quality time together. This was a very needed vacation. The hot tub was wonderful and we played many games of pool. We didn't want to leave. Nothing negative to say at all. We are planning to come back to Pigeon Forge and will be booking this same cabin if it's available. We enjoyed our stay so much and the cabin was beautiful. always great to deal with cabins USA staff. very helpful. We loved the cabin and the location! The hot tub worked great but not in a very private location. The bed in the master room upstairs was very uncomfortable! Very broken down!! Needs replaced! The couch upstairs and downstairs needs replaced, also very broken down!! The tub upstairs has a huge hole in the side where you bring your leg up and around to get in, very sharp and dangerous! I would also throw away all the decor pillows! They are getting worn and nasty. Other than those items we loved the cabin and location. We would absolutely come back if those things were replaced! We loved this cabin!!! Definitely recommend!!! Great location!!! We have stayed in the same cabin as last year because the location is perfect. There are only a few things that need to be addressed. The floors were not cleaned well as there were crumbs left from the previous people and the front burner on the stove did not work. Thank you for taking the time to let us know about your recent stay in Autumn Ridge! We here at Cabins USA strive to give each of our guests the best stay possible while vacationing in the Smokies. I apologize for the issues you experienced with the stove and the cleanliness of the cabin. Your comments have been forwarded to our maintenance and housekeeping departments to be addressed. Thank you again for your review and thank you for choosing Cabins USA! Our stay was excellent. The cabin was just as described, and we loved the pool table and hot tub. The o lay suggestion would be some kind of book or information sheet on how to get the TVs to work (which we had trouble with), when to put trash out, etc. as we have seen in other house rentals. Overall, we had a great time in Tennessee. I am so happy to hear that you enjoyed your stay in Autumn Ridge! We here at Cabins USA strive to give each of our guests the best stay possible while vacationing in the Smokies. When you are ready to stay with us again, please mention you are a return guest for an additional discount. Thank you for choosing Cabins USA and we look forward to having you as our guest again soon! There are a few things broken in the cabin that need fixed or replaced: electric can opener, iron, bed upstairs is wore out already, fan exhaust in upstairs bathroom dont work, door knob is messed up in downstairs bathroom, chair downstairs is about to fall apart, pool table is broke on one end and hot tub is falling apart. And fire extinguisher needs cleaned and checked, maybe put a tag on it and have cleaning staff initial that its been checked. Another thing i accidently messed up our check in dates and staff said there was nothing they could do cause i asked to at least refund me that day or something, i think they should take care of their customers and make customers happy and figured something out so that they make sure their customers come back. I was highly upset with myself for messing up the dates and wasting 200 bucks cause we checked in a day after our original check in date and i had booked a hotel for us that night that we could of checked in at cabin so we wasted over 270 bucks. I just had alot going on in my life with my gpa passing away and work and doing everything else and this was my least worry goin on vacation and i messed up the check in dates and i just wish cabin usa could of helped us out but they didnt. We all love the cabin and its beautiful but because of cabin usa not trying to do anything to make us happy we will probably not go back. We had a wonderful stay with Cabins USA. Our cabin was clean and beautiful. We enjoyed having a large back deck with rocking chairs. The kids enjoyed the game room for hours. The company provided everything we needed from extra towels to kitchen items. The check in was easy. We would recommend this cabin for any family vacation. Very spacious cabin, bigger than I thought! This cabin also has 2 roll out couch beds, which came in handy for us. There are cabins pretty close to this one, its not pictured very well but it didnt bother us. I would recommend this cabin and company. We will probably be staying with Cabins USA the next time we stay in piegon forge. Thank you for taking the time to let us know about your recent stay in Autumn Ridge! We here at Cabins USA strive to give each of our guests have the best stay possible while vacationing in the Smokies. When you are ready to stay with us again, please mention you are a return guest for an additional discount. Thank you again for your review and thank you for choosing Cabins USA! This was our 4th time to stay at this property. It has everything we need and is very convenient to the parkway. It's a very nice cabin. Thank you for all of your kind words! We here at Cabins USA strive to give each guest the same great stay you enjoyed while vacationing in the Smokies. Thank you again for choosing Cabins USA and we look forward to seeing you again soon! The only negative was we had one ceiling fan downstairs that had 3 out of four lights not working. Otherwise it was a very enjoyable stay. Thank you for letting us know about the lights in the ceiling fan. Your comments have been forwarded to our maintenance department to be addressed. Thank you for choosing Cabins USA and we look forward to having you as our guest again soon! This cabin was perfect for what we needed. It was very spacious with very comfortable beds and enough room for 5 adults to spread out comfortably. The location was super easy to find and access and there was enough parking for 2 SUVs. The two king size beds were great and slept very well. We had a problem with bugs in the bathrooms but called maintenance and they were there within a few hours (even at 11:00 at night). He was VERY friendly and was intent on trying to rid the problem for us. He was unfamiliar as to what kind of bugs they were, but once he sprayed, we only saw a few more for the duration of our trip. He also replaced a few lights that were out while he was there. The cabin in my opinion, could use a little TLC in some places, but it was mostly cosmetic and nothing that affected our stay. As always, Cabins USA made check in and out extremely convenient and the value is the best we've found. We will definitely book again with Cabins USA. We enjoyed our stay very much. Thank you for helping to make our mini vacation memorable. 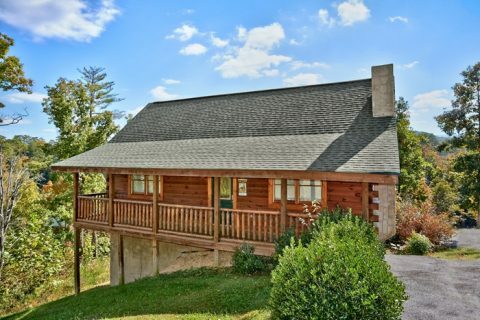 We love going to the Smokies and Pigeon Forge and we absolutely loved our cabin. Even though it rained and it was cold, we all had a wonderful time and made new memories!!! It was great hot tub did not work on Friday maintenance came out that night and looked at it said something was broke, it finally was up and running by 5:00 the next evening so that was really the only negative thing. The cabin was great, we had a wonderful time there. More than enough room for our family if 4. We did have a light out, called office and someone was out within 30mins to fix. I will be staying again in the future. I am so happy to hear that you enjoyed your stay in Autumn Run! We here at Cabins USA work hard to make sure each of our guests have the same great stay you enjoyed while vacationing in the Smokies. I apologize for the lack of towels in the cabin. Your comments have been forwarded to our housekeeping supervisor to be addressed. When you are ready to stay with us again, please mention you are a return guest for an additional discount. Thank you again for your review and thank you for choosing Cabins USA! The cabin was very nice and we enjoyed our stay. We had a little issue with how many days we had booked but the staff was very helpful and kind in helping with that process. One suggestion I have is that there needs to be more towels and wash clothes. For a four night, five day stay I don't like having to resuse wash clothes. I would also suggest maybe having a broom and things like that left there. Other than that we had a wonderful time and would stay again. Thank you for all of your kind words! We here at Cabins USA work hard to ensure each of our guests have the best stay possible while vacationing in the Smokies. Thank you for your suggestion. Your comments have been forwarded to our housekeeping department. When you are ready to stay with us again, please mention you are a return guest for an additional discount. Thank you again for your review and thank you for choosing Cabins USA! Our cabin was lovely , plenty enough space but yet still cozy. Beds were comfy even the sleeper sofas which is rare. Contacted staff for a new tank for the grill and had it within 30 minutes. Very good experience and would love to go back! I am so happy to hear that you enjoyed your stay in Autumn Ridge! We here at Cabins USA work hard to ensure each of our guests have the best stay possible while vacationing in the Smokies. When you are ready to stay with us again, please mention you are a return guest for an additional discount. Thank you again for your review and thank you for choosing Cabins USA! Everything was perfect and I plan on using y'all again! I also have had friends ask me about cabins USA and I have them all your information! Thank you for all of your kind words! We here at Cabins USA work hard to make sure each of our guests have the same great stay you enjoyed while vacationing in the Smokies. When you are ready to stay with us again, please mention you are a return guest for an additional discount. Thank you again for choosing Cabins USA and we look forward to having you as our guest again! Only thing I would change is to have someone look at the dryer, it would not dry. Thank you for taking the time to let us know about your recent stay in Autumn Ridge! We here at Cabins USA work hard to make sure each of our guests have the best stay possible while vacationing in the Smokies. I apologize for the issues you experienced with the dryer. Your comments have been forwarded to our maintenance department to be addressed. When you are ready to stay with us again, please mention you are a return guest for an additional discount. Thank you again for your review and thank you for choosing Cabins USA! The cabin and location were great. There were some minor issues, but didn't cause any problems. The toilet in the lower level had issues, but was resolved quickly. A suggestion would be to add additional rocking chairs on the deck, as were are very senior citizens, and the four of us like to rock together. In the future, I will need to reserve a two bedroom cabin, with all on the same level, but I don't know if any of these exists, Overall, everything was great, and we truly enjoyed our stay. Thank you for taking the time to let us know about your recent stay in Autumn Ridge! We here at Cabins USA work hard to make sure each of our guests have the same great stay you enjoyed while vacationing in the Smokies. I am happy to hear that our maintenance department were able to take care of the issues you experienced. When you are ready to stay with us again, please mention you are a return guest for an additional discount. Thank you again for your review and thank you for choosing Cabins USA! Autumn RIdge is in the perfect location. Right off the parkway. The cabin was clean and the staff is always extremely helpful. I do wish the cabin driveways were marked with the cabin name or address. It was difficult to see the cabin sign in the dark. Beds/mattress do need to be replaced. We have rented from CabinsUSA for 3 years and will do so again. Everything was wonderful. We will stay at Autumn Ridge again. I am so happy to hear that you enjoyed your stay in Autumn Ridge! When you are ready to stay with us again, please mention you are a return guest for an additional discount. Thank you again for your review and thank you for choosing Cabins USA! Very nice cabin and location was also. Would recommend to anyone. I am so happy to hear that you enjoyed your stay in Autumn Ridge! We here at Cabins USA work hard to make sure each of our guests have the best stay possible while vacationing in the Smokies. Thank you for all of your suggestions. Your comments regarding the stove have been forwarded to our maintenance department to be addressed. Your comments about the privacy screen have also been forwarded to our Owner Liaisons who will bring this to the owner's attention. Thank you again for choosing Cabins USA and we look forward to having you as our guest again! Overall, this was an excellent cabin! We were impressed with how comfortable and clean the cabin was on arrival. We were a little sad that the property was so close to other cabins and there were a handful of dents and dings (just a bit of character!). We had to call the office only once and they were both helpful and prompt in getting back to us. I would absolutely stay in this cabin (or another like it) again in the future! Thank you for taking the time to let us know about your recent stay in Autumn Ridge! We here at Cabins USA work hard to make sure each of our guests have the best stay possible while vacationing in the Smokies. When you are ready to stay with us again, please mention you are a return guest for an additional discount. Thank you for choosing Cabins USA and we look forward to having you as our guest again! 1. The contract that I signed stated that check in time was at 3 PM and made it very clear that any attempts to check in sooner would have undesirable consequences. However, when I read my check in instructions on the day of check in, they stated that check in is at 4 PM. I called to get this straightened out and they said that they were in the middle of a policy change and the cabin isn't guaranteed to be ready until 4 PM even though my contract says 3 PM. This was an issue since we had already arrived earlier than we expected from Michigan and now would possibly have to wait another hour to check in. I find it unfair that there would be consequences if I were to violate our contract but Cabins USA can violate it as they please. 2. The dishes in the cabin were NOT clean. There was stuck on food on almost every dish and utensil. I did also stumble across a cockroach on the couch. Not cool. I would expect a spider, or a moth, but a cockroach is not a good sign. We had a great time! The cabin was very nice. The beds were super comfy. The location is awesome! We have used cabins usa for several years and they have been great to deal with. Can't wait to go back! The cabin was great!!!! The only thing I didn't care for was fighting off stink bugs at night. Autumn Ridge was a great cabin for us, good location, very clean and comfortable, and had a nice clean and well functioning hot tub ,which is a priority for us. When we arrived at the cabin there was no heat due to a broken thermostat, however the maintenance people took care of the issue promptly and were very courteous and helpful, we would stay there again. I am so happy to hear that you enjoyed your stay in Autumn Ridge! Our maintenance department works hard to ensure that each of our guest's issues are corrected in a timely manner. When you are ready to stay with us again, please mention you are a return guest for an additional discount. Thank you again for your review and thank you for choosing Cabins USA! We really enjoyed the layout of the Autumn Ridge cabin. Everything was well-appointed and we loved the convenience of being so close to the main Parkway. We also loved seeing the Christmas decor once we entered the front door. Very charming touch! Just to note a few areas of opportunity: the master upstairs is in desperate need of a sleepable bed as well the sofa in the living area. You couldn't sit on it without making contact with the bars underneath because it had no padding. Jacuzzi in the bedroom was nice as was the view inside and out. If the living room sofa and master bed were replaced, I wouldn't hesitate to book this cabin again! Loved the location and the cabin. It was so nice that it was decorated for Christmas, nice touch. Loved the convenient location of this cabin. It is near the Parkway. The mountain views from the back deck are beautiful. I am so happy to hear that you enjoyed your stay in Autumn Ridge! We work hard to make sure that each of our guests have the same great stay you experienced while vacationing in the Smokies. When you are ready to stay with us again, please let our reservationists know you are a return guest for an additional discount. Thank you again for your review and thank you for choosing Cabins USA! We love this cabin. We will stay here again in the future. Only problems were minor. Two of the stoves burners were not working as they were not on our last stay either back in April and the downstairs toilet runs all the time. Great cabin otherwise. This cabin was more than we expected, we absolutely loved it :) our kids did not want to leave. We will definitely be back an will refer our family n friends to cabin USA. I am so happy to hear that you loved staying in Autumn Ridge! When you are ready to stay with us again, please let our reservationists know you are a return guest for an additional discount. Thank you for choosing Cabins USA and we look forward to seeing you again soon! The entire cabin was extremely clean. The kitchen was well equipped; the best I have seen. Great location. Thank you for all of your kind words! Our housekeepers work hard to make sure that each of our cabins are thoroughly cleaned and fully stocked so all you have to do is walk into your cabin and start relaxing. When you are ready to stay with us again, please let our reservationists know you are a return guest for an additional discount. Thank you again for your review and we look forward to having you as our guest again! Cabins USA and autumn ridge cabin were fantastic! I will not recommend anyone who don't deserve it and I always tell the truth on these reviews and cabins USA was out of this world awesome! VERY clean, cabin was organized and very conveniently located right off the strip in pigeon forge...I have already recommended this place to my friends and family and will to others! The views were spectacular from Autumn Ridge Cabin. Get this, Cabins USA even takes the water out of the hot tub and cleans it and feels it back up after each guest! Wow! Thank u Cabins USA for such nice hospitality and thank u owners of Autumn Ridge Cabin for allowing us to stay in your cabin! We WILL be back....! Thank you so much for all of your kind words! WE here at Cabins USA work hard to make sure that each of our guests have the same great experience you did while vacationing in the Smokies. We also appreciate when our guests refer us to their family and friends. Thank you again for your kind review and we look forward to having you as our guest again! We had a great time at this cabin. It was beautiful. Great location. The only problem we had was the dryer. It would take four cycles to dry a batch of cloths other than that it was awesome. It was outer first trip to gatlinburg and it won't be our last. Thank you for choosing Cabins USA for your first trip to Gatlinburg and I am happy to hear that you enjoyed your stay in Autumn Ridge. I apologize for the issues you experienced with the dryer. Our maintenance department was notified of this issue and they are working to take care of it. Please feel free to contact one of our reservationists whenever your ready to make your next reservation. They are always more than happy to help you find the perfect cabin. Thank you again for choosing Cabins USA and we look forward to having you as our guest again! We loved this cabin. It had everything we needed. The cabin was very nice and roomy. Everyone really enjoyed the pool table downstairs. Having 2 king bedrooms was great. The bathtub upstairs needed a little cosmetic work done to it. It was peeling on the outside of the tub. The cleaning crew needs to be more accurate. Wasn't as clean as it should have been but it didn't bother our stay. I would definitely rent it again or refer it to family and friends. The only issue we had was when we checked out. We checked out before the office was open and the phone system would not let us leave a message it just keep telling us an operator would be with us shortly. Would have been a wonderful stay but the ladybugs consumed our entire stay. Literally drove us crazy. Thank you for your review. Cabins USA takes constructive criticism very seriously and if our guests have any issues during their stay, we are always very quick to correct the situation. We take pride in our high level of customer service and our quality cabins. We apologize for any inconvenience. We are always transparent with our prices including fees and taxes. We hope that we be hearing from you again soon for your next vacation to the Smokies. My boyfriend Steve & I recently visited Pigeon Forge & Gatlinburg, TN, we checked in on Monday 10/13/14 which was my boyfriend's birthday & also his first trip to the mountains, we stayed in a beautiful cabin in Pigeon Forge called Autumn Ridge for the whole week. The staff was extremely nice & polite upon my arrival for check in on Monday 10/13/14, they were very effiecent & quick with processing my check in. They provided us with directions to our cabin that were very easy to follow, upon arrival we found it very clean & beautifully decorated. I will highly recommend Cabins USA to anyone looking to make reservations for a nice relaxing trip to the beautiful Pigeon Forge & Gatlinburg, TN area. Very nice cabin, good location. We will be back next spring. My husband and I, and another couple, really enjoyed our stay at the Autumn Ridge cabin. It was clean, set up well, so there was privacy between the two couples. We had some issues with our TV's....to many remotes and not familiar with the cable company and how to use the remotes. One remote for the TV and one for the DVD (if you wanted to use it) would have been much easier to figure out. Kept getting "no signal" and had to call maintenance to fix. The hot tub controls buttons had been pushed underneath the face plate, and when we called maintenance, about the TV, we left a note about it. We left to go play golf, and when we returned, everything was fixed. A couple suggestions is to put a blind on the door on the bottom floor and to provide blow dryers. Got up early and took a shower, but there was no blow dryer, so had to wait until my hair dried to be able to curl. Also, if a channel list for the TV's were provided, it would help find a channel without going through every one (again, we are from out of town and channels are different than what we have at home). Other than small inexpensive suggestions, we had a great time. The picture did lead you to believe the cabin was a little more remote than it actually was, but our stay at Pigeon Forge was great! Thank you for your review. We are delighted that you had a great stay with us at Autumn Ridge. We apologize for any inconvenience you may have experienced during your stay with us, and we are delighted that maintenance was able to address all your issues you reported. We appreciate all your feedback on your stay with us. We hope that we will hear from you again in the future. We loved Autumn Ridge and thoroughly enjoyed our much-needed family vacation! We did not plan to arrive in the dark... 2 extra hours of stopped traffic in KY made our trip longer...but once we got to the cabin...the stress of the trip just melted away! Cabin was very clean! My boys are eager to return! Thank you Cabins USA for a great vacation destination! Was a great location for us. Near to the pool. We loved the swing and rocking chairs on upper deck. Only thing We think should be addressed is the ice maker on fridge did not work. Have booked it for another visit already. Staff was great to work with and made us feel very welcome. Staff was excellent to work with. Cabin was in great location off the main road, but easy to get to. Cabin was really clean. This beats staying in a cramped up hotel anyday. Jacuzzi tub wasn't working when we got there but repair man came and fixed that. I have talked to my friends and family about Cabins USA and we have discussed making plans to stay there again. It was a wonderful facility except we got attacked by bumble bees when you go in the house. This was the cleanest cabin we have ever stayed in. The pots and pans were worn and it was to close to other cabins, but was still one of the nicest we have stayed in. Had a great time can't wait to come back. Thank you for your review Lesa. We are happy that you had a great time and thoroughly enjoyed Autumn Ridge. We look forward to hearing from you again soon, and we appreciate your feedback. Do not forget about our return guest discount. Enjoyed our stay there this was our first time using CABINS USA we are already planning to spend our next Christmas there and also going to get the cabin next door so the whole family can come. Would recommened a newer pool table and balls the table it self is pretty worn out and the balls are so chipped cant really play pool correctly worked for the kids tho Everything else we loved perfect location Close to the main parkway but yet still far enough to feel like your way in the mountains Love Love Love this cabin !!!! We had a great stay !! Enjoyed it very much !! The only reason I am giving an 8 on amenities is because that we arrived we found out that the oven on the stove didn't work. But the repair service was great and trying to get it fixed for us, and Cabinsusa were very kind about the situation. Other than that we loved it. We would not use anyone else other than Cabinsusa ! Love them and loved this cabin it was nice and very roomy for 7 of us! We had a wonderful time Thank you so much for allowing us to stay at a place that was like being at home. We brought our daughter and our 2 grandchildren and we all had a wonderful time, there was something for all of us to do. It was really awesome. After we got to the cabin, Autumn Ridge, and got settled in we noticed the remote was missing in the downstairs bedroom so my husband called and informed the office and they had one out there within 30-45 minutes. I was in the jacuzzi 2 out of the 3 nights we were there and enjoyed it very much. The hot tub was nice also. Thank you for everything Cabins USA and the Property owners of Autumn Ridge!! We really love Autumn Ridge but our family is growing and next year we need 3 bedrooms. Does the owner of Autumn Ridge have any other properties with more bedrooms? Or could you recommend something. I've looked and it seems so many are already taken. We love the decorations, the cleanliness and the ease of getting to Pigeon Forge. Let me know. Thank you. This was my first time renting a cabin in the Pigeon Forge area so I did not know what to expect. I did not really expect all of the traffic that was present so when checking in make sure you don't miss the building or you will have a tough time getting back there. The cabin was wonderful. The first thing I noticed was that it was very clean. The location was great because you were only minutes away from all of the attractions but you were far enough away that you didn't hear the crowd noise. Overall I have to give Cabins USA two thumbs up they did a wonderful job. this to the owners........The cabin was clean..........The Goodson's Smiths Station, AL. I have rented several cabins over the past few years and this cabin is by far the best one. It was super clean. My family enjoyed it very much. Extremely enjoyable weekend, thanks to you. Great cabin, great service. We'll be back!!!!!!!!!!!! Overall we had a great time and really enjoyed the cabin. The only thing that can improve is the linen of the Cabin. The bed sheets were stained and looked extremely old. My suggestion is that the linen gets changed asap. Other than that we hope to return in 2012. It was everthing one could ask for. It was just what we were looking for. I would stay with Cabin U.S.A. again for sure. Thank you for choosing Cabins USA. We are so happy to see that you enjoyed your stay. We hope that you will stay with us again soon. We had a great time, and we actually want to rent the exact cabin again next Thanksgiving holiday. Will get back to you after the holidays to do that. We really do love this cabin and the surroundings. Checking In was a problem because we recieve the wrong cabin number and the wrong code for the door. But that is a small thing that happend. Our stay there was perfect. The only real concern to me was on the bottom level where the hot tub is, I thought there should be something done for more privacy and protection. The first night we were there my kids and I got in the hot tub and all I could think about was a bear could come right through the front yard and hop right onto the deck and there would be no way out. Now the probability of this is slim but you just don't understand my luck. So, therefore we no longer used it. The jacuzzi had black stuff in the jets so that wasn't used. Other than that the stay was great and the cabin is beautiful, thinking of building one similiar for ourselves. Thanks so much! Thank you for choosing Cabins USA. We are glad you enjoyed your stay with us at Autumn Ridge. We hope that you will keep us in mind for your future visit to the Great Smoky Mountains.